What Is Restorative Dental Work? From full mouth reconstruction to a simple filling, restorative treatment will recreate a functional bite and improve oral health. Ashwani Sharma, DDS and the team at Brookside Dental Care, dedicate themselves to creating beautiful, healthy smiles for every patient. If you or a loved one is experiencing tooth pain or have not seen a dentist in more than six months, contact our Indianapolis office to schedule a consultation today. Before we proceed with restoration work, we make sure your gums are healthy and disease free. If necessary, we treat gum disease first to create a healthy foundation for your new restoration. During your evaluation, Dr. Sharma will explore your gums and jaw bone health to determine if you are a good candidate for the procedure. Implant-supported crown – Filling in for a single missing tooth, the crown attaches to the implant via an abutment. It will look and feel like natural. Implant-supported bridge – When you have neighboring missing teeth, this anchored bridge option will fill the gap without compromising neighboring teeth as do traditional bridge options. Implant-supported partial or full denture – Are a permanent option for denture wearers to relieve the discomfort and movement of traditional denture plates. This option is especially helpful to secure lower dentures that typically give the most movement problems. In addition to completing your smile, an implant-supported option helps maintain the integrity of your jaw bone. A traditional restoration remains on the surface, whereas the implant is secured to the bone and provides the stimulation necessary to keep the bone healthy. The implant will also help renew chewing and speaking ability, strengthen your bite, and prevent early facial aging due to bone loss. Root Canal Therapy – To save as much healthy tooth possible, we may suggest root canal treatment to restore a damaged tooth. This process entails cleaning out bacteria and infection from the tooth and roots and placing a crown to protect the remaining structure. Extraction – If the tooth is unsalvageable, we will suggest its removal and discuss options to replace it. Talk To Us About Endodontics! How Do You Fix TMJ? Many treatment plans begin with services to correct temporomandibular joint disorders or TMJD. If the joint of the jaw (TMJ) is damaged in any way, it can lead to localized pain, headaches, facial or ear pain. For patients who have reoccurring or constant pain, Dr. Sharma can help. TMJD is often associated with misalignment problems, tooth grinding, or teeth-clenching. Dental appliances or orthodontics can help correct these problems. Once Dr. Sharma had created a foundation of health, he can successfully create a healthy, functional bite that will last. Crowns are tried-and-true dental restorations and can solve many dental problems. Repair – Crowns can restore a tooth when there is significant damage from decay, cracks, or chips. Protect – Seal and strengthen the tooth after root canal treatment or the removal of a failed restoration. Replace – Sculpted to fit your bite, the crown is one component of a traditional bridge or dental implant solution. Crown treatment typically takes two office visits, with time in between to create the crown. In most cases, there will be about a two-week waiting period for the lab to complete your crown. The first visit is used to diagnose the problem, create a bite impression, prep the tooth, and fit a temporary crown until the next appointment. During the second visit, the temporary is removed, the final crown is cemented in place, and final shape adjustments are made to complete your bite. Care for your crown as you would the rest of your teeth. Brush and floss at least twice per day, paying close attention to where the gum meets the tooth. A good oral hygiene routine will help maximize the life of your crown. A dental bridge is a cost-effective tooth replacement solution for patients with a few neighboring missing teeth. Like any treatment plan, determining if a dental bridge is the best solution begins with an evaluation of your basic oral health. Dr. Sharma examines the surrounding teeth and gum tissue and evaluates your jaw bone density if you are considering an implant supported option. Similar to crown placement, removable and fixed bridges take two dental visits to give the lab time to create the final product. 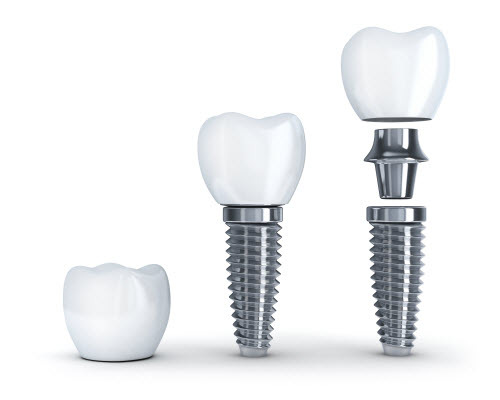 Implant supported bridges take additional time for implant placement and recovery. How Long Does It Take for My Dentures to Feel Normal? Living with dentures takes time and practice. Your gums will eventually adapt to wearing the denture throughout the day, and sometimes, fit-adjustments are necessary. Ready to Restore Health and Function to Your Smile? Call Today For Dental Restoration! Restorative dental services will help you regain oral health without compromising aesthetic goals. If you are experiencing tooth pain or have missing teeth, schedule an appointment with Brookside Dental Care.